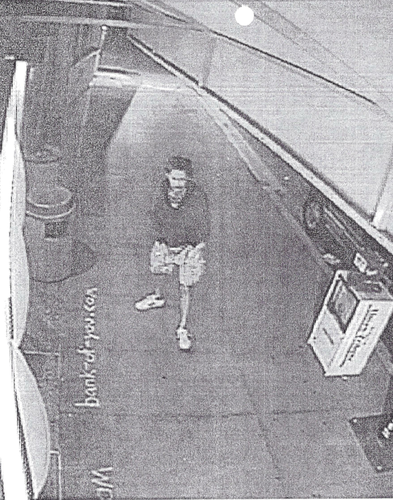 Jeff Olson, caught on security camera, outside a San Diego Bank of America. 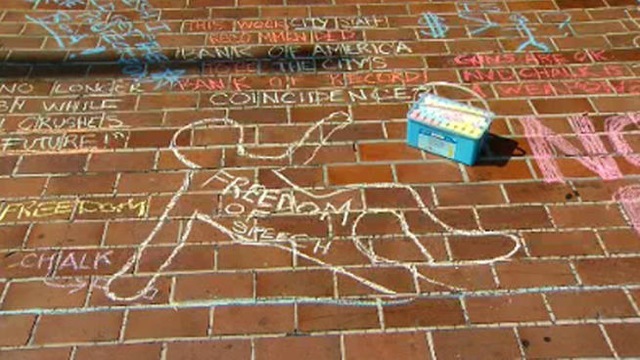 In July 2013, a California jury dismissed vandalism charges against Jeff Olson for writing in sidewalk chalk on the outside a San Diego Bank of America. Olson was acquitted on July 1, 2013 of all thirteen counts of vandalism, which could have resulted in thirteen years in prison or fines of $13,000. Olson was arrested after he wrote adverse statements aimed at Bank of America on the sidewalk at several of its locations. His artwork included statements such as “NOT THANKS, BIG BANKS,” accompanied by drawings of an octopus reaching for dollar bills. Bank of America’s Vice President, Darrell Freeman, complained to the Deputy City Attorney and the San Diego Gang Unit, which ultimately lead to the vandalism charges. BoA claimed that it cost them $6,000 to remove the chalk drawing. As part of his defense, Olson claimed that his chalk art was an expression of his First Amendment Rights. However the Judge, Howard M. Shore, disagreed and refused any mention of the First Amendment in the proceedings, pointing out that the State’s Vandalism Statute (Penal Code section 594s) does not mention an exception for First Amendment rights. Jan Goldsmith, head of the San Diego attorney’s office. There is a strong case precedent for Judge Shore’s decision including the the strangely similar case of MacKinney v. Nielson in 1995. In that case, Christopher MacKinney was arrested in 1992 by Sargeant Nielson for writing, “A police state is more expensive than a welfare state- we guarantee it.” The federal Court of Appeals ruled that the police lacked the probable cause to arrest MacKinney. 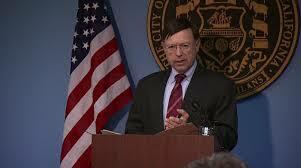 The vandalism charges against Olson has sparked “chalk-ins” across the country. The incident has inspired “chalk-ins” across the country. Sources: “Chalk Activist Triumphs over Big Bank,” Hyperallergic, July 1, 2013; “Not guilty verdict for San Diego chalk protestor,” Salon, July 1, 2013; “Chalking the plank: Judge won’t allow bank protestor to claim first amendment rights,” San Diego Reader, June 25, 2013; MacKinney v. Nielson, 69 F.3d 1002, 1004 (9th Cir., 1995).